You’ve probably heard us mention Retinol before, but how exactly does this product fit into a typical skin care regimen? For years now, we’ve found that Retinol is one of the tried and true solutions for stimulating collagen development and cellular turnover, treating acne, and reducing the appearance of fine lines and wrinkles. 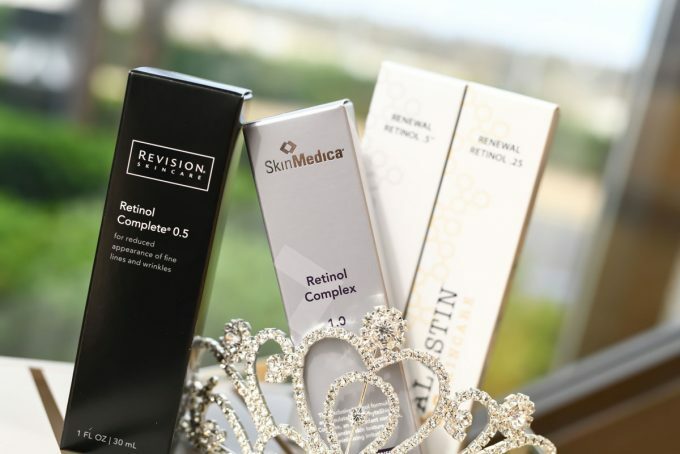 Our goal is to keep patients informed on all things related to skin health, so we want to highlight why we recommend Retinol over similar products such as Retin-a and Tretinoin. · Irritation – Retinol is neutral in nature and therefore is not as aggressive on the skin. Retin-a and Tretinoin, on the other hand, are acidic and commonly cause the skin to dry out and become inflamed. Not only is skin irritation uncomfortable, but it can also speed up the aging process. · Penetration – You want to find a product that can go deep into the skin and deliver desired results. Retinol is proven to better penetrate the skin and convert into Retinoic acid, the active form of the chemical that helps reduce the appearance of fine lines and wrinkles and treat acne. · Storage – Another major advantage of using Retinol over Retin-a or Tretinoin is its ability to be converted back into an inactive form and stored in the skin. Your body absorbs the amount of Retinol it needs to stimulate collagen development and then stores the remaining product for future use. Retin-a and Tretinoin do not convert back into an inactive form and thus have a much shorter lifespan. · Year-long Use – A common misconception around Retinol is that you have to stop using it during the spring and summer months to avoid irritation. Retinol can be used all year-round so long as it is paired with a medical-grade sunscreen to help protect your skin against increased sun exposure. We encourage patients to keep up with their regimen from season to season to get the best results from their Retinol products. The biggest takeaway is that Retinol delivers the same results as Retin-A or Tretinoin without the associated negative downsides. Our patients tolerate Retinol very well and thus are able to use it on a more regular basis in coordination with other skin care products. Providing you with medical-grade products that deliver long-term skin health benefits is at the core of what we do, which is why we can’t recommend enough the use of Retinol in your routine. There’s always room to enhance your skin care regimen, so book an appointment today to learn about our selection of Retinol products! You can also learn more about the differences between Retinol and Retin-a by watching this short video from Dr. Seiler.